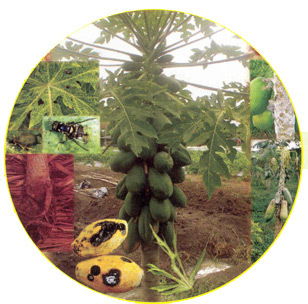 Medical plant Pepaya or (Carica papaya) is a plant That Trunked upright and wet. Palms resemble papaya, white flowers and reddish yellow ripe fruit, it feels like a melon. this medical plant height can reach 9 meters with strong roots. Strand leaves resemble the human hand. If the leaves of papaya are folded into two parts exactly in the middle, it would Appear That the leaves of papaya are symmetrical. Cavity in the form of stars papaya fruit cross section. This plant medical is also cultivated widely in gardens Because of its fruit is fresh and Nutritious.